Senator Gustavo Petro is one of Colombia’s most prominent leftist politicians, and both feared and loathed by the country’s traditional political forces. Petro joined the urban guerrilla movement Movimiento 19 de Abril, better known as M-19, in the 1970s when he was 17. He quickly moved through the ranks and became the youngest member of the five man Central Region Leadership. According to La Silla Vacia, Petro never saw combat and is remembered by his fellow ex-guerrillas more as a thinker and political strategist than an armed revolutionary. While active in the M-19 he held his first elected posts, first as Ombudsman of Zipaquira in 1981, then as councilor for the city in 1984. However, in 1985 his political status was not enough to protect him when the national army came looking. He initially managed to escape by dressing as a woman, complete with dress and high heels. But shortly after, soldiers captured him and, according to Petro and his friends, planted a pistol and a grenade on him before torturing him to extract a confession. He was to spend 18 months behind bars for possession of weapons, during which time he was transferred several times by officials concerned about his attempts to organize prisoners to demand their rights. He also became renowned for his efforts to curb drug abuse and encourage education among inmates. When Petro emerged from prison, the M-19 was in crisis. Their disastrous assault on the Palace of Justice in Bogota had been the latest in a string of strategic catastrophes that had eroded public sympathy and created powerful enemies. With many M-19 leaders dead, Petro became a driving force in the push towards demobilization and a peace process. Petro was instrumental in the formation of the political party Alianza Democratica M-19 (AD M-19), which replaced the guerrilla movement and participated in the 1991 assembly to rewrite Colombia’s constitution. In 1991 he also became one of the first candidates from the new party to hold office when he was elected to the House of Representatives. 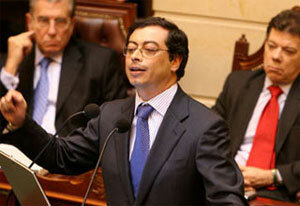 After Petro lost his seat in 1994, he left Colombia after receiving death threats over his denunciations of corruption. For two years he worked in the Colombian Embassy in Belgium as a diplomatic attaché for human rights. Petro returned to the House of Representatives in 2002 when he was elected as a member of the leftist movement Via Alterna. In 2005 he played a role in unifying leftist parties and politicians, including the AD M-19, to create the Democratic Pole (Polo Democratico Alternativo – PDA). Standing for the PDA, he was elected senator in 2006. During Petro’s time in congress he became known as an ardent critic of the government and frequently engaged in verbal warfare with then President Alvaro Uribe. He was also known as a relentless campaigner against corruption and the infiltration of armed groups into politics, playing a role in uncovering and pursuing both the parapolitics and FARC-politics scandals. Critics of Petro, including Uribe, have frequently suggested he is linked to the guerrilla insurgency, alluding to his leftist politics and guerrilla past. He has always gone to great lengths to deny any relationship with the FARC, denouncing them as “criminals” and scoffing at their leftist credentials. Petro’s antagonistic relationship with government worsened when it became evident he was a victim of a wiretapping and surveillance campaign orchestrated by Colombia’s secret service, the DAS, who were allegedly reporting back to the presidential palace. In 2010, the PDA selected Petro to run as its presidential candidate. He finished a distant fourth behind winner Juan Manuel Santos, Antanas Mockus and German Vargas with 1.3 million votes. Throughout the campaign, cracks began to show in the relationship between Petro and the PDA leadership, who he viewed as ideologically rigid, hierarchical and clientalist. Soon after he broke away from the party and formed his own “Progressive Movement” to stand as Bogota mayor. Petro bet to capitalize on the downfall of his old allies the Democratic Pole in the race to be mayor. The PDA has won the previous two mayoral elections in Bogota but has been discredited by the public works corruption scandal that took down currently suspended mayor Samuel Moreno. The tactics proved effective, with Petro winning the elections with 32% of the votes against 25% for the centrist former Mayor Enrique Peñalosa. Inspector General Alejandro Ordoñez, one of Colombia’s most conservative politicians, dismissed Petro halfway his term in a controversial decision over the handling of Bogota’s trash collection during the first year of the mayoral term. According to the Ordoñez, Petro had violated free market principles for trying to bring the city’s monopolized trash collection under municipal control. The dismissal was internationally rejected and revoked. Ordoñez was later dismissed himself after the State Council found his reelection had been illegal. The initiative impeded a referendum to take place that sought to impeach the mayor, whose popularity had hit rock bottom. Petro was able to use the dismissal to his advantage by portraying himself as a victim of anti-democratic forces. His clash with Ordoñez allowed Petro to position himself as the leading anti-establishment candidate ahead of the 2018 presidential elections, but had also accumulated animosity with conservatives over his past with the M-19. Furthermore, his combative attitude also fired up opposition to his candidacy, among both moderates and Colombia’s conservative voter base. While Petro tried to portray himself as a reformer who would strengthen democracy, his detractors falsely, but successfully claimed he was close to the Venezuelan government and the FARC. The candidate seemingly survived an assassination attempt while he was on his way to a campaign rally in Cucuta, a city on the border with Venezuela. Authorities, however, have insisted his armored car was hit by rocks, not bullets. Following an extremely polarized election campaign, Petro made it to the second round, but lost to right-wing candidate Ivan Duque, Uribe’s protege. His entry to the second round allowed Petro to return where he has performed best during his political career, the Senate where he took a leading role in the opposition against Duque.